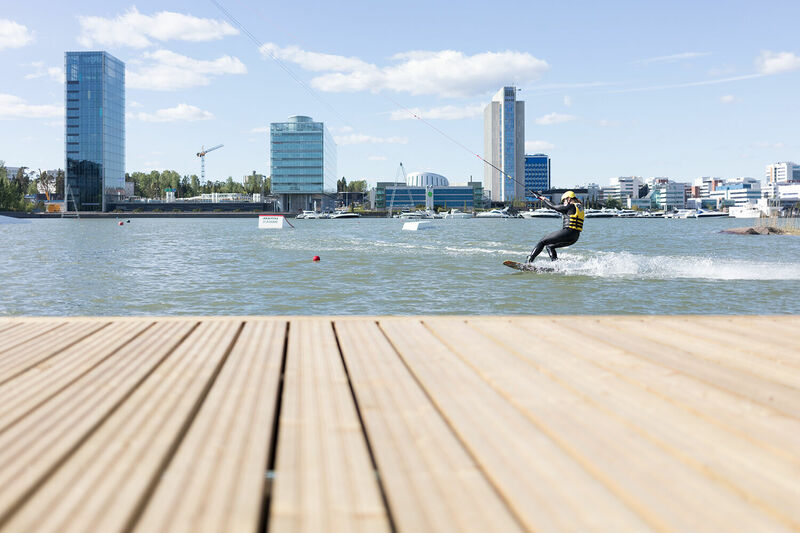 Laguuni is a floating oasis for various watersports located in Espoo. It offers top-notch conditions for Stand Up Paddling, SUP polo, wakeboarding, canoeing and flyboarding. The sports can be combined in various ways also for all kinds of groups and levels. Laguuni’s restaurant Blägä offers quality burgers, fresh salads and tasty drinks. Cablewake is a fun and fast pace activity, with the possibility to push your limits with all kinds of flips and spins. 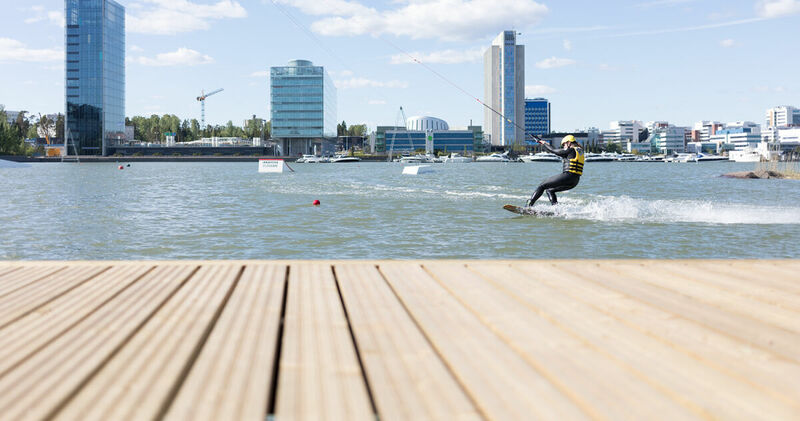 Environmentally friendly cables make practicing wakeboarding skills easier, cheaper and more versatile. The cables in the Lagoon run exceptionally on solar energy (thank you Fortum!). We have two cables, the gear needed as well as professional guidance to ensure your first time on board goes as smoothly as possible. As a beginner all you need is a swimsuit, towel and a curious smile! SUP = stand up paddle boarding is one of the fastest-growing sporting activities in the world. Supping is an easy and fun way to spend a relaxed summer day or improve your fitness level. Laguuni offers SUP courses, trips, yoga and of course the hottest thing in summer 2019 – SUP polo! Kayaking - You can rent a kayak and enjoy the beautiful views around the Espoo archipelago! We have kayaks and paddling equipment for beginners and more advanced kayakers. We also offer courses and trips for all levels! Experience our sauna at sea! Our unique sauna raft is open daily. You can book the sauna on the main page. The sauna raft is available for private hire. Restaurant Blägä serves the most famous burgers in Espoo, alongside with delicious, fresh premium salads. We tailor your day so that it works for your group. With our expert instructors and guides, you will have a supportive, safe environment in which you can try wakeboarding, SUP boarding or kayaking – regardless of your group members’ ages and experience levels. Our group days have a good vibe guarantee – if you feel like the day didn’t meet your expectations, we will find a way to make it up to you!